Transformers Combiner Wars started its run centered on the Aerialbots and Superion, nearly all of wave 1 focused on this team and the mighty gestalt they combine to form. Adding new members to the roster, the Aerialbots ranks remain focused on the skies, a rarity for the Autobots; the series turns classic character Powerglide into a team member by making him into a gun for Superion, and adds new character Alpha Bravo to swap in for Slingshot. As part of the Transformers brand’s May Mayhem, the last classic member of the team, Slingshot, is getting released as a shared online exclusive the 3rd week of May. As part of this review, the focus will be on their vehicle modes as a group, their robot modes as a group, and of course on their combined form, Superion. 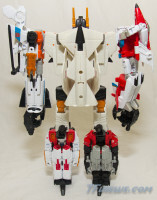 Aerialbots Vehicle Modes: All of the Aerialbots are aircraft, and many are in their classic G1 forms. Nearly all of them are military or militarized aircraft, leaving out Silverbolt whose vehicle mode is a passenger plane. Aside from newcomers Powerglide and Alpha Bravo, the vehicle modes have a lot of robot mode bulk underneath which gives them a sense of unity but also makes them less compelling as vehicles. But it’s Alpha Bravo and Powerglide who are the odd bots out as their vehicle modes just don’t seem as much part of the supersonic team. When it comes to the accessories, some of the vehicles wear them better than others; Alpha Bravo and Silverbolt integrate their accessories into vehicle mode better than the rest. Aerialbots Robot Modes: Except for Powerglide, this team really looks like they are cut from the same cloth, not just due to the combiner joints but a general design and G1 aesthetic sensibility. There’s a harmony to their designs, each one has unique personality to their look yet is part of a team; this except for Powerglide, who was never originally meant to be an Aerialbot and now his inclusion borders on elitism — all the flying alt-mode Autobots hang out together, “no cars allowed!” The variety in colors and in facial likenesses gives a nice variety to a team that has shares a lot of design touches throughout. The blocky look is en vogue with these guys, and the deluxe guys with their exposed combiner joint in the chest, similar leg and arm transformations, a lack of integration on vehicle mode elements, and even using shared parts for some bots definitely feel a bit too similar. With the Aerialbots, there’s a shared group of highs and lows. Alpha Bravo gets the best weapons, the rest of the hand/foot accessories and hand-held weapons are ok but not as inspiring; Silverbolt has the dullest accessories in the group. 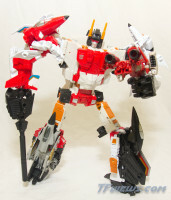 Combined Mode – Superion: Where vehicle and robot modes have some shortcomings, the Aerialbots’ combined mode of Superion makes great use of those figures to become a cohesive giant robot. 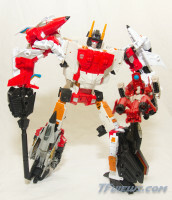 Superion stands tall and looks distinctively unified as a combiner with a heroic, proportioned physique, he’s not too bulky and has a restrained backpack. Nobody really looks out of place in the traditional G1 layout. Swapping Quickslinger for Alpha Bravo does change things up, but the white coloring and aerial theme remain constant. 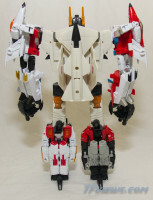 The arms, as with all the combiners in this line, do have exposed robot arms visible, but they do attach intentionally. In terms of colors, Silverbolt’s off-white color wasn’t an issue for me as an individual bot but as the central combiner it does feel odd since he shares the same red with everybody (minus Alpha Bravo) but not the same white. All combined, Superion weighs about 1.25 pounds, and stands about 11.1 inches high at the head, another half-inch for antennae and arm kibble (which is about an inch taller than the previous modern combiner, Fall of Cybertron Bruticus). 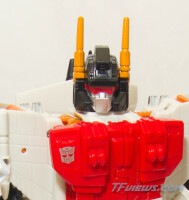 Superion is pretty solid all around, though an area that could run into issue is the shoulders – if the chest plates not being locked all the way together it can lead to the shoulders separating from the body when swapping arms – but generally this is minor. Every limb figure has good clearance, although you can’t go for a truly G1-accurate look with the legs without de-transforming the cockpits; between the exposed robot arms facing forward and the loss of the knee articulation, it isn’t worth doing. Balance is pretty good on Superion despite a lot of weight held above the waist, standing at attention has a lean backwards at the knees from the weight on the transformation joints, but with a little practice, Superion can take some decent poses — the key is to use articulation, balance, and every joint available. The shared hand/foot accessory between Firefly and Quickslinger are keen hands giving Superion a punch with a twin laser blast. The shared hand/foot between Air Raid and Skydive, while not as impressive as an accessory, make even better hands as the weapon element makes for a knuckleduster that clearly will pack a punch. Alpha Bravo gets his own unique hand/foot that adds twin gatling guns to his fist, and that looks great as well. Silverbolt’s combined weapons make for a larger version of the G1 figure’s gun that scales much better to this guy, but is a little light on detailing. Powerglide as a weapon looks a little better here than with other figures, the plane elements feel more like theme than they do kibble on the blaster when in Superion’s hand. Overall: As a team, it’s clear that Powerglide and Alpha Bravo aren’t quite as easy additions to the team, not sharing some of the flaws of the others, but are arguably the best figures as individual purchases from this team. That said, the classic 5 characters really have a harmony about them, sharing similar problems and highlights. As vehicles, the Aerialbots are ok but come up a bit short (except for Powerglide and Alpha Bravo), however they come up short in the same ways which somehow feels appropriate. They are all jets wearing a mass of brick of robot kibble underneath. Including Powerglide, they all expose their robot arms in vehicle mode. As individual robots, the Aerialbots all share a sense visual connection with coloring and sculpting touches, and have quite the Generation 1 presence as a group. Aside from Powerglide, they also share similar issues with the unattractive exposed combiner joint in the chest, and a sense of not integrating the vehicle elements into robot mode that well. As their combined form, Superion brings together all the Aerialbots into a pleasing giant robot form with a proportionate build, strong joints, and a unified colorscheme. Like the character himself, the Aerialbots’ biggest merit is the harmony they bring together in Superion, making an all-around satisfying massive warrior combiner. The only real issues are the exposed individual bots’ arms in their arm modes, and knees that lean back slightly in simple poses. While Superion is a pretty awesome combined figure, as a team of individual bots the Aerialbots are a tad underwhelming and share too many similarities. 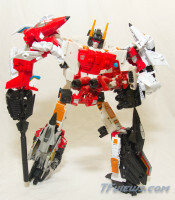 So are the successes of Superion enough to justify the drawbacks of the team members? And what does it say that Alpha Bravo and Powerglide are the best of the bunch despite not fitting in that well with the team? Ultimately, it depends entirely on what you’re looking for: if you want a cohesive and satisfying combiner first and foremost then the Aerialbots are a good way to go; if you want a team of great individual Transformers first then maybe wait for other teams in the line.